Designed as a lower-cost alternative to individual rocket launches and for servicing space stations, the Dawntreader is a reboot to the older, more costly, space shuttle program. Utilizing newer, higher durability engines, fuels, and designs of the modern era, as well as a larger payload to allow for fewer flights and a larger payload than previous shuttles, the Dawntreader is purposed for long endurance flights, as well as powered flight to and from space, allowing for less planning and more emergent flights. 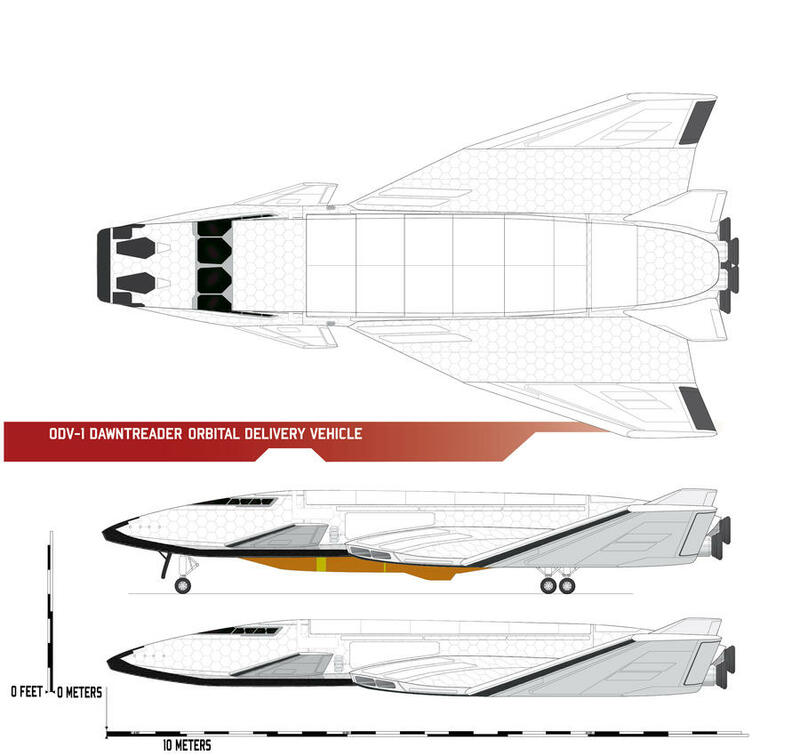 The Dawntreader is the first spaceplane of Halcyon design, and was intended to field larger spacestation modules with it's massive cargo bay. It's primary method of flight are six air-breathing turbofan engines, chosen for lower fuel consumption. Once at high altitude it must add additional liquid-rocket boosters to the combination to both accumulate air for the air-breathing engines for their final stage of use. Once too high to use air-breathing engines, the rockets are the only source of propulsion. For takeoff, it is commonplace for the ODV-1 to be fitted with a large, wide, aerodynamic conformal fuel-tank which is jettisoned in atmosphere and picked up after parachuting to the ground. For longer duration or higher-altitude missions, the ODV-1 can also undergo mid-air refueling operations. Last edited by Pharthan on Thu Jan 15, 2015 4:33 am, edited 5 times in total.